The Reinländer (Reinlaender, Reinlander) Mennoniten Gemeinde was a denomination founded in 1875 in Manitoba under the leadership of Ältester Johann Wiebe (1837-1905) of Rosengart, Manitoba. This church was also commonly known as the Alt-Kolonier or Old Colony Mennonites because they were formed of emigrants from the Chortitza (the first or "Old Colony" in Russia) and Fürstenland colonies. Aeltester Johann Wiebe was originally from Fürstenland, Russia. One bishop, five other ministers, and two deacons emigrated from Russia prior to 1880 and were accepted as leaders by the newly organized church. Twenty-two more were elected in Manitoba between 1876 and 1922. These 30 men are listed in the Reinlaender Gemeinde Buch as recorded by Bishop Isaak M. Dyck (1889-1969) of Mexico. The first meeting house for this church was constructed in 1876 and used until the church came to an end in Manitoba with the migration to Mexico from 1922 to 1925. The building was then taken over by the Blumenorter Mennonite Church, which consisted of recently arrived emigrants from Russia in the 1920s. The Reinlaender Mennoniten Gemeinde in Manitoba dissolved about 1925 after all leadership had migrated to Mexico. The church had 1,648 members in 1891 and a total of 3,948 souls which included the unbaptized children that belonged to church families. The membership peaked around 1899 with 2,186 members and a total of 5,640 souls. In 1899, 49 families left for the Northwest District (which became Saskatchewan in 1905). From 1900 to 1904, additional 125 families moved west. In 1904 the membership was 1,885. 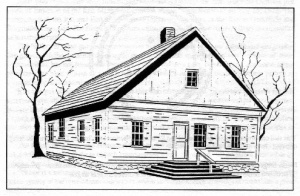 The Manitoba Public School Act of 1890 had created public school districts throughout the area in which the Reinlaender Church members had settled. When the Manitoba Provincial Government passed its compulsory school attendance legislation in 1916, people of the Reinlaender Church who had gone along with the 1890 Act faced what many considered a further deterioration of their promised religious freedom. The issues related to public schools eventually led to the decision to immigrate. About two- thirds of the entire Manitoba Reinlaender group immigrated to Mexico between 1922 and 1926 where they founded the Manitoba Colony. The remaining families were without church leadership after 1925 and so the "official" Reinlaender Mennonite Church ceased to exist in Manitoba. Unofficially the remaining group in Manitoba had one meeting place left for them which was in the village of Chortitz. Eventually this group reorganized in the 1930s and registered their denomination as the "Old Colony Mennonite Church of Manitoba." Dyck, John and William Harms, eds. Reinländer Gemeinde Buch 1880-1903. Winnipeg, MB: Manitoba Mennonite Historical Society Inc, 1994. Dyck, John and William Harms, eds. 1880 Village Census of the Mennonite West Reserve, Manitoba Canada. Winnipeg, MB: Manitoba Mennonite Historical Society Inc., 1998. Epp, Frank H. Mennonites in Canada 1920-1940: A People's Struggle for Survival. Toronto, ON: Macmillan of Canada, 1982: 94 ff. Plett, Delbert F. Plett, ed. Old Colony Mennonites in Canada 1875 to 2000. Steinbach, MB: Crossway Publications Inc., 2001. Zacharias, Peter D. Reinland: an Experience in Community. Reinland, MB: Reinland Centennial Committee, 1976, 350 pp. Redekopp, Alf. "Reinlander Mennoniten Gemeinde (Manitoba)." Global Anabaptist Mennonite Encyclopedia Online. January 2004. Web. 21 Apr 2019. http://gameo.org/index.php?title=Reinlander_Mennoniten_Gemeinde_(Manitoba)&oldid=93365. Redekopp, Alf. (January 2004). Reinlander Mennoniten Gemeinde (Manitoba). Global Anabaptist Mennonite Encyclopedia Online. Retrieved 21 April 2019, from http://gameo.org/index.php?title=Reinlander_Mennoniten_Gemeinde_(Manitoba)&oldid=93365.